The P&S XPRESS Interior Cleaner Bottle is the perfect bottle to pair with the P&S XPRESS Interior Cleaner. This bottle is color coded and pre-labeled as "XPRESS Interior Cleaner" so you will never confuse this product for another. On the back of the label P&S lists application steps along with safety info. This bottle does not come with a trigger but the DI Accessories Chemical Resistant Spray Trigger is a perfect fit. The bottle is 32 ounces. 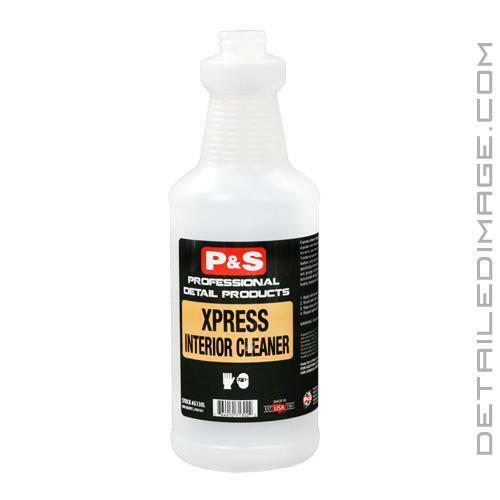 If you are looking for an easy way to dilute or simply use your XPRESS in a small bottle, the P&S XPRESS Interior Cleaner Bottle is a great product to pick up. Looking to pick up the XPRESS Interior Cleaner, XPRESS Interior Cleaner Bottle and the Chemical Resistant Trigger? Check out the P&S XPRESS Interior Cleaner Kit!